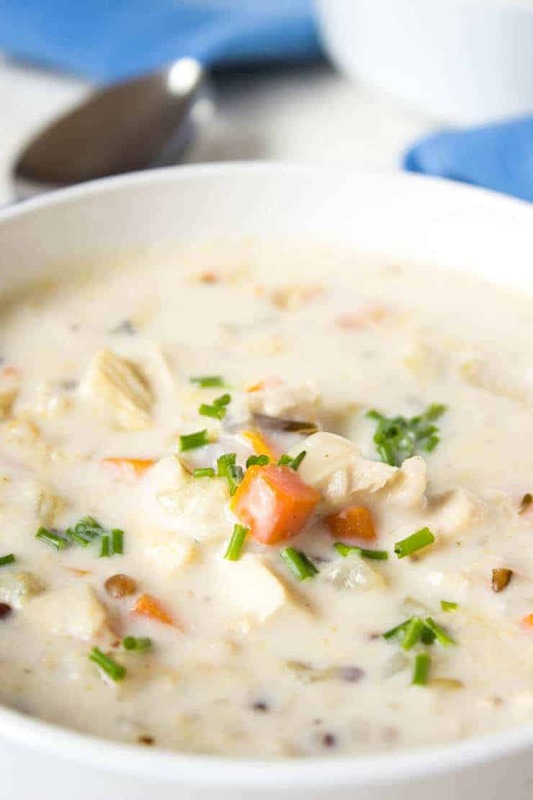 This Creamy Chicken and Wild Rice Soup is a family favorite. It may be spring, but the evenings are still cool and sometimes even darned right cold. A nice bowl of soup always is satisfying and warms me right up! What is a wild rice mix? Wild rice mix is a mixture of different types of rice. 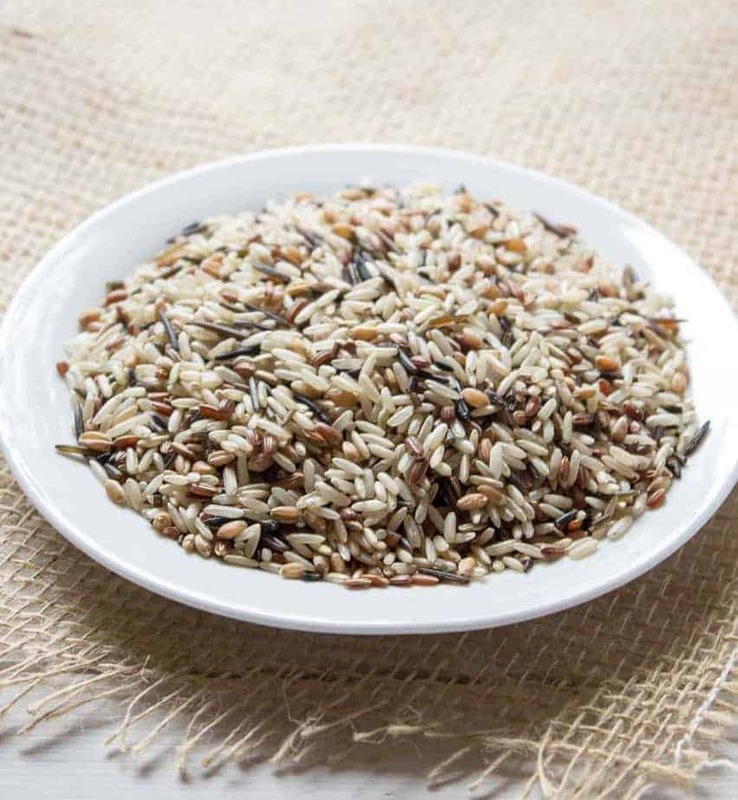 Typically you will find wild rice, white rice and brown rice. Sometimes you will also find red rice added too. Make certain your mix does not contain any flavorings. You just want the rice. You could also use all wild rice instead of the blend. Does the wild rice get cooked before adding to the soup? No, the wild rice gets added directly to the soup and is cooked right in the soup. How long does it take for the wild rice to cook in the soup? It takes approximately 30-45 minutes for the rice to cook in the soup. I’m not going to lie. One of our favorite soups has been from a packet that you just dump into a pot, add water and cook. It goes with us on camping trips and I’ve used it at home when I’m in need of a quick soup. My daughter has been after me for a while to make this soup from scratch. After a couple of trials, I finally nailed a perfect creamy chicken and wild rice soup! Sometimes they are spot on with what they think, “It needs to be thicker and creamier.” This last comment held true with this soup. I was trying to get it thick and creamy without using a ton of heavy cream. The first few batches I made tasted delicious, but were a bit too soupy. Hmmmm….you would think soupy would be a good description for soup! But this soup is a creamy soup and it needed to be creamy. How can I thicken soup? When I want a thicker soup, I often add cornstarch mixed with a bit of water. Add just a bit at a time so you don’t over thicken. Can I reheat this soup? Yes! This soup can be reheated. Just place in a pot and reheat over a low temperature. This soup can be eaten as a light dinner or lunch. It was perfect eaten right after it was made, but it seems to get even better the next day. All the flavors really develop and meld together. Either way it is delicious! 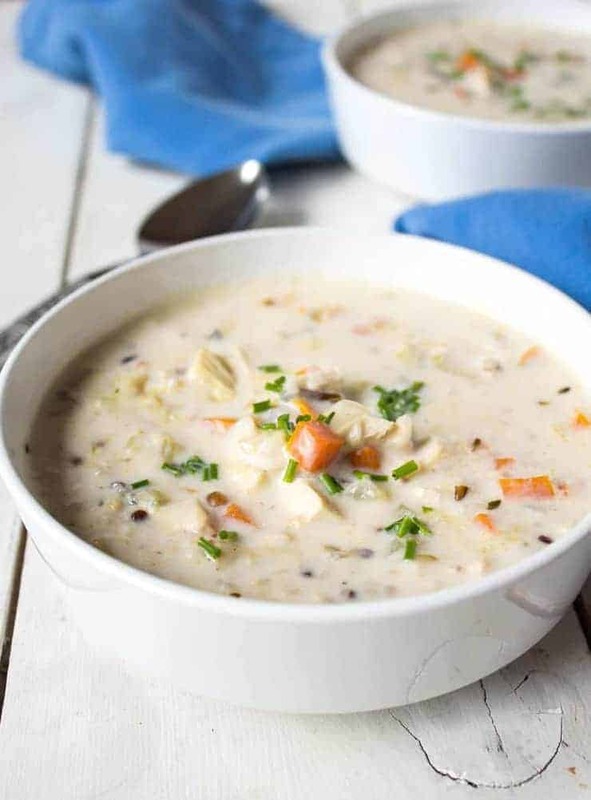 Hearty and delicious soup with chicken and wild rice. In a soup pot over medium heat add oil. Add celery, onion, and carrots. Saute for 5-8 minutes until soft. Stir in garlic. Continue cooking for 1 minute. Add chicken broth and wild rice. Stir and cook for 45 minutes, until rice is cooked. Stir in chopped chicken, salt, pepper and thyme. In a small bowl, mix cornstarch and water. Pour into soup mixture while stirring. Simmer over medium for 10 minutes. Stir in milk half and half. When heated through, soup is ready to serve. Always add salt and pepper to taste. I use homemade chicken broth without any salt and often need to add a bit more salt than stated in the recipe. If you want a thicker, creamier soup, substitute milk for all half and half. What does wild rice mix mean? Did I miss something? Is that cooked or raw rice? Help! You can purchase a mix of wild rice and long grain rice at the store. You could also use all wild rice. 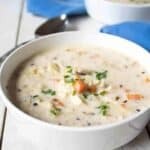 I love a good creamy wild rice soup and this one looks great. I could eat soup year round, even when it’s hot, which it is here already. Sigh, I like the cold weather. I am a huge soup fan, and this reminds me of one I bought a lot at a cafe by where I went to school. Delicious! I lived in Minnesota for one year and a version of this soup was my lunch every single day. I just started making it last year and find it so comforting! Can’t wait to try your recipe. I hope it’s as delicious as the one you remember! This is such a pretty, lovely bowl of good old fashioned soul food. 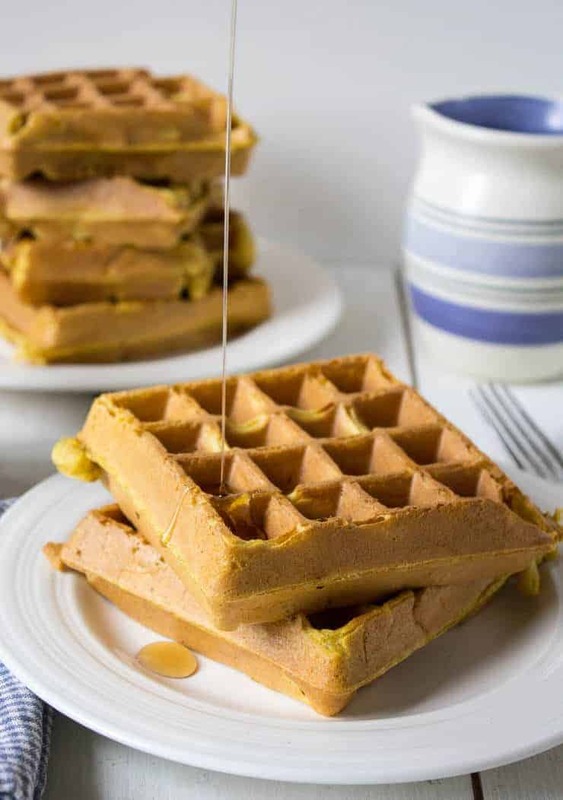 YUMMM!!!!! I will be making this. this is soup looks really tasty ? Love that you re-created the packet soup and made it into a home cooked version! I have recently started cooking a lot more with wild rice and just love it! 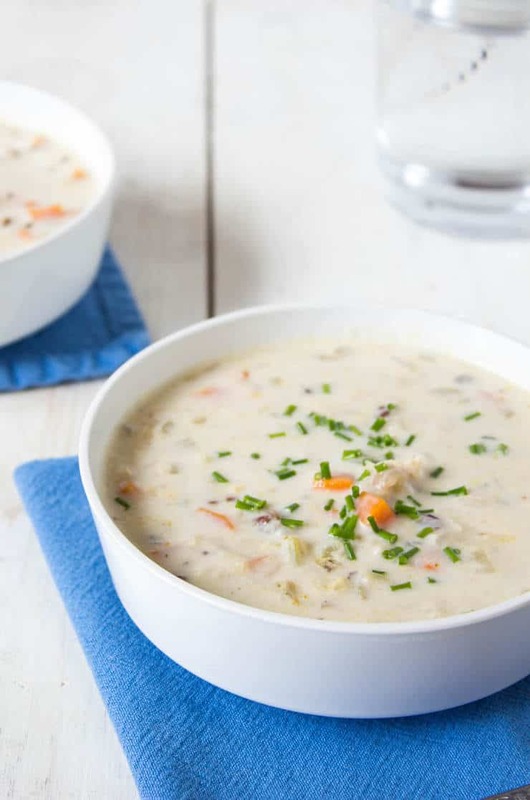 I have my own version of chicken and rice soup but will have to try yours! I am such a sucker for any sort of wild rice soup! This looks so cozy and comforting!! One day the weather will turn warmer! In the meanwhile, we will just need to keep eating soup! There is something so calming and comforting about soup! 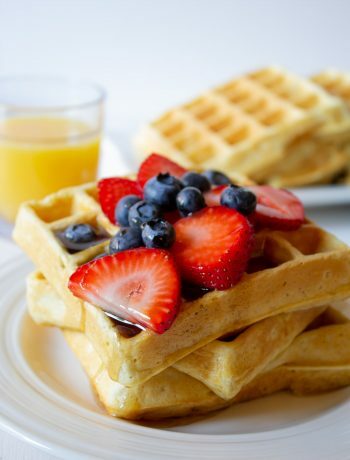 This one especially, with it creamy base and rice I could eat this anytime morning, noon or night! Take care. I think soup has magical qualities! Kids sure can be totally honest. I’m glad you figured out how not to make soupy soup! This sure looks like you nailed it! This is one of my husband’s favorite soups Kathy! Pinning and trying soon! We had snow here this weekend!! Spring just won’t come! But this soup will certainly make things better! 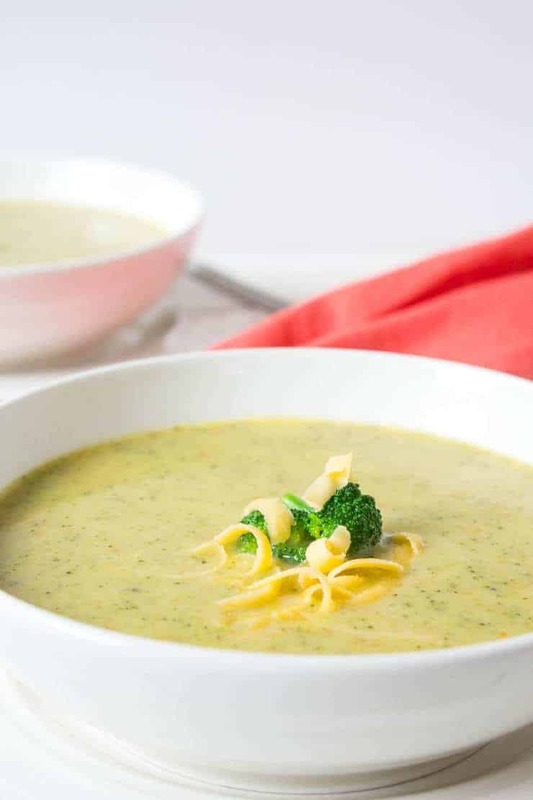 I love creamy soups and this one looks super delicious. Love the wild rice in there. What a perfect dinner with a hunk of bread for dunkin’ 🙂 !! Pinned! My husband actually really likes canned soup, so no judgement on the packet soup here! The weather here has been rainy and cold the past two days, so soup is definitely on the menu! 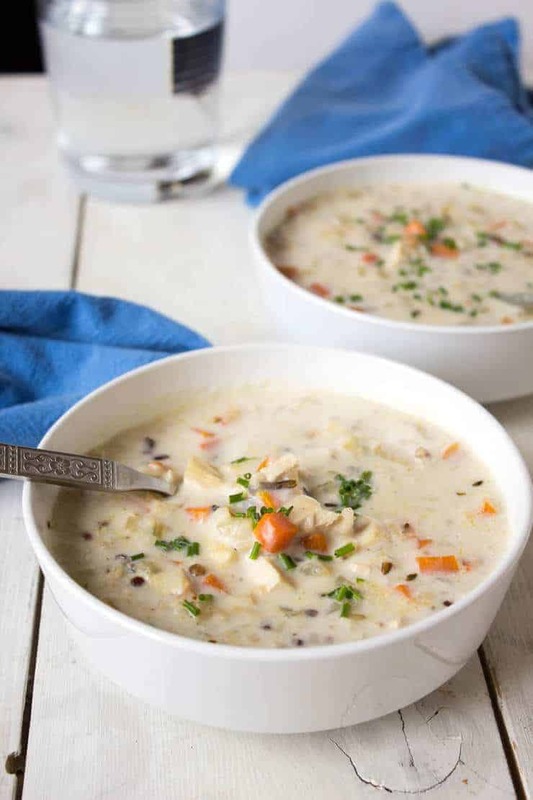 Loving this chicken and wild rice soup!! Gimme all the creamy-dreamy soup! Cheers! We woke up today to a snowy landscape, again. Spring definitely is lost somewhere. Your soup would be just what the doctor ordered. It looks great and the perfect amount of creamy! Spring just seems to be having a tough time getting here! This soup should help!